So you love your pet cat to bits – so much so that you want nothing but the very best for it. It might have more than one ball of yarn to play with, and it also loves having you around as you flick on that laser pointer, where it chases the point of light all night long with a dedicated frenzy that only company bosses and top management wish that their subordinates had while they are at work. Well, how about letting your cat have the very best when it comes to pooping as well? 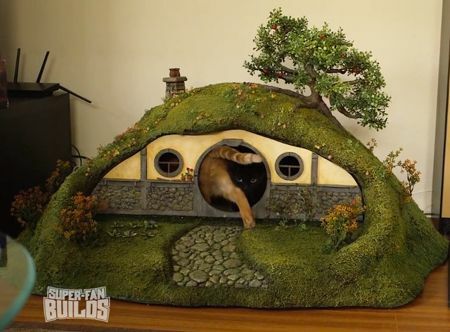 This Hobbit-hole will come covered with lush greenery, sporting a stone walkway that would lead to the classic round Hobbit door, where your pet feline would then enter to do its business in private, emerging like a Nazgul afterwards, looking for its next prey. The amount of effort that some people go to for their furry kids deserves a salute!